A libellous thornFrancois-Marie Arouet (1694-1778) adopted the name Voltaire in 1718 following a sojourn in the Bastille. The name may be an anagram of Arouet l j (Arouet le jeune), substituting v and i for u and j. For much of his life he was a libellous thorn in the side of the establishment in France and often a fugitive. Following a second visit to the Bastille he was exiled to England in 1726, remaining for about three years. Voltaire was welcomed in England as a distinguished exile from French illiberality. Taken up by Queen Caroline, he made friends with the Walpoles, Congreve, Bolingbroke, Bubb Doddington, Sarah Duchess of Marlborough and, of course, Pope. He is known to have visited Alexander Pope in Twickenham in 1728 where, at the dining table, he is held to have made a joke sufficiently indelicate to make Pope's mother leave the room. The story, promoted by Dr Johnson who disliked Voltaire is apocryphal: another version holds that it was Pope himself who left the room. Voltaire is remembered in England for his comment on the execution of Admiral Byng in 1757: "Dans ce pays ci, c'est bon, de temps en temps, de tuer un amiral pour encourager les autres." From Pantheon to waste pitWhen he died his body was quietly removed from Paris, being brought back in revolutionary triumph in 1791 for reburial in the Pantheon. However, in 1814 when the monarchy was restored his bones were secretly exhumed and buried in a pit in waste ground, something which was not discovered until 1864 when the republic was finally established and his grave investigated. 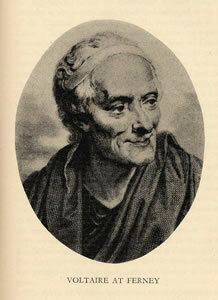 Read some of Voltaire's quotations.